Chris Grigalunas’ passion for racing did not start with a dirt bike, but rather with a ’72 Volkswagen Beetle. Chris Grigalunas’ passion for racing did not start with a dirt bike, but rather with a ’72 Volkswagen Beetle. As a high schooler, the dirt bike was his dream, but his parents, considering a more practical and affordable option, instead gave him the old Beetle, which Chris carefully “nursed to health.” Chris’ need for speed was not deterred, however. A few years later, he purchased his first race car and trained to be a high performance driving instructor. Most recently, Chris launched Azul Motorsports, a company that provides clients with the opportunity to experience the thrill of driving on a high-speed track, allowing Chris to share his passion for racing with others. In addition to Azul Motorsports, Chris is the founder of EPM&BI, a professional services company that uses data to help his clients make better decisions, and is a UGA donor. Chris gives back to the University of Georgia through a monthly recurring gift to the Georgia Fund. He cites one of his motivations for donating as the U.S. News and World Report’s list of the best public institutions in the country, which includes the percentage of alumni making donations to their alma maters as a factor in its ranking. By giving to the Georgia Fund, Chris is doing his part to boost his alma mater’s reputation around the world. “Every little bit does help. It doesn’t have to be a lot of money at first – hopefully in the future it can be – but why not start now?” said Chris. 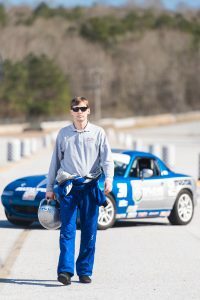 As an undergraduate student at the University of Georgia, Chris pursued his other interest, computers, and sought a career path that would allow him to try his hand at his passion for racing. He knew that “big data” was an emerging field, and so he chose to major in Management Information Systems at the Terry College of Business. Chris describes his years at UGA as formative, emphasizing that they “laid a foundation” and prepared him for his start in the corporate world. In 2014, he decided to go out on his own and opened not one but two companies, EPM&BI and Azul Motorsports. “You don’t invent your passion and career path; you find it along the way. And when you do find it, follow it,” said Chris. 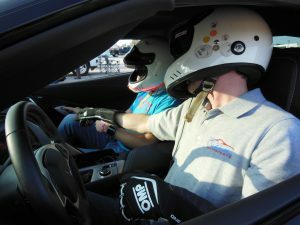 With Azul Motorsports, clients are able to spend the day on the racetrack, pace-car free and with other drivers, after receiving formal training with an instructor. Chris’ dedication to his company is greater than realizing his own dream – it’s rooted in a love for teaching others and sharing the experience of racing with those who have yet to discover it. “It’s all about the experience. The smells, sounds, g-force, and adrenaline – these aspects make the ride memorable,” said Chris. Chris’ recent recurring gift to the Georgia Fund ensures that his impact on the university is ever-present. What’s your cause? Undesignated gifts to the Georgia Fund go entirely to fund scholarships, allowing talented students in your field to pursue their education and discover how they can change the world. 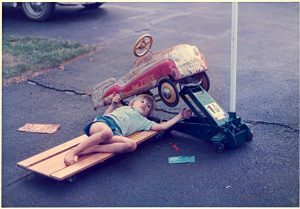 A young Chris tunes up a go cart. Chris’ passion for racing started from an early age. Chris introduces one of his clients to the thrill of high-speed racing.